Place all ingredients except Dr. Pepper™ in a slow cooker. Pour in Dr. Pepper™ and stir ingredients to combine. Cover and cook on low heat for 8-10 hours or overnight until pork is very tender. 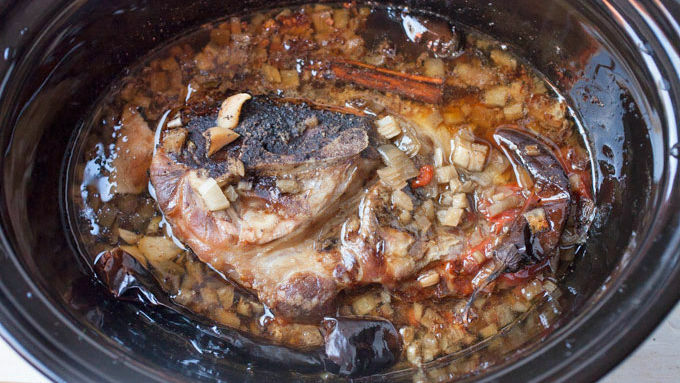 Remove pork from slow cooker and shred with a fork. Carefully pour the cooking liquid into a large bowl and strain out any solids (chiles, garlic, etc.). Return shredded pork and 1 cup cooking liquid to the slow cooker. Switch heat setting to warm and keep covered until ready to serve. OPTIONAL: For a delicious homemade barbecue sauce, pour the rest of the cooking liquid into a small pot and simmer 10-15 minutes over low heat until thickened. Serve with buns, barbecue sauce and pickles, if desired. If you have leftovers, allow pork to cool almost completely before storing in your fridge or freezer. 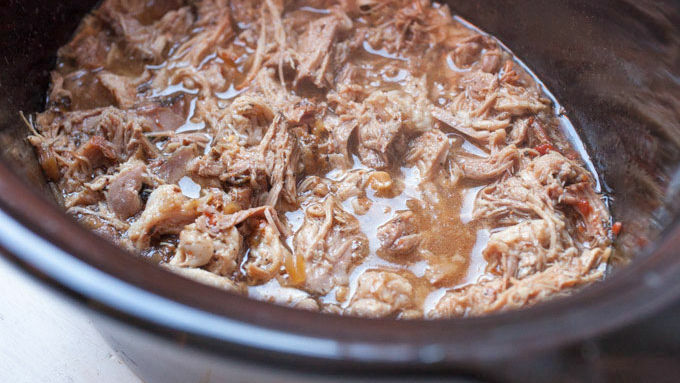 Making slow-cooker pulled pork is one of my favorite weekend activities. It makes the whole house smell amazing and is perfect whether you’re entertaining (hello, football fans) or stocking the fridge with meals to enjoy throughout the week. One awesome trick to making slow-cooker pulled pork is to use Dr. Pepper™ as a base for your cooking process. The soda actually helps break down the pork and gives it just enough sweetness. Getting started couldn’t be easier. Just add all your ingredients to a slow cooker, then pour in your Dr. Pepper™. It’s okay if the liquid doesn’t cover the pork entirely. Stir everything together a bit and then cook on low heat for 8-10 hours. (I usually just let mine cook overnight.) The results are pretty spectacular! At the end of the cooking process, you also have the base for a great “Carolina-style” barbecue sauce to serve with the pulled pork. This style of sauce is thinner than the bottled stuff you might be used to, but tastes great spooned over the pulled pork in a sandwich. If you prefer a thicker consistency, just combine a little cornstarch with water and add it to the pot. 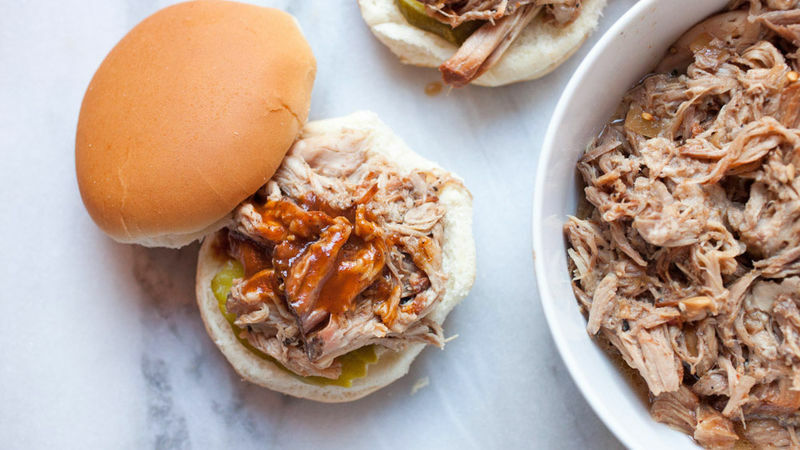 Making slow-cooker pulled pork is one of my favorite weekend activities. It makes the whole house smell amazing and is perfect whether you’re entertaining (hello, football fans) or stocking the fridge with meals to enjoy throughout the week. 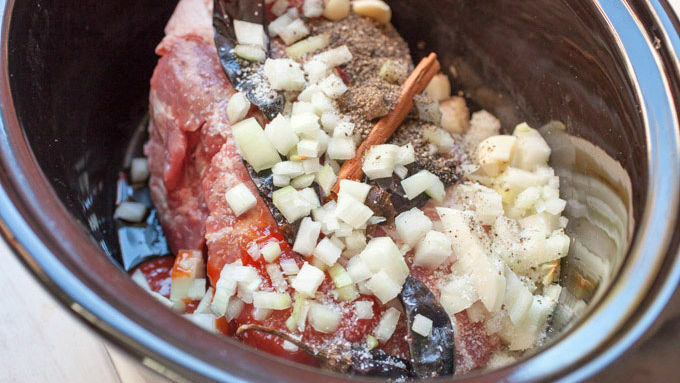 One awesome trick to making slow-cooker pulled pork is to use Dr. Pepper™ as a base for your cooking process. The soda actually helps break down the pork and gives it just enough sweetness. Getting started couldn’t be easier. Just add all your ingredients to a slow cooker, then pour in your Dr. Pepper™. It’s okay if the liquid doesn’t cover the pork entirely. Stir everything together a bit and then cook on low heat for 8-10 hours. (I usually just let mine cook overnight.) The results are pretty spectacular! At the end of the cooking process, you also have the base for a great “Carolina-style” barbecue sauce to serve with the pulled pork. This style of sauce is thinner than the bottled stuff you might be used to, but tastes great spooned over the pulled pork in a sandwich. If you prefer a thicker consistency, just combine a little cornstarch with water and add it to the pot.